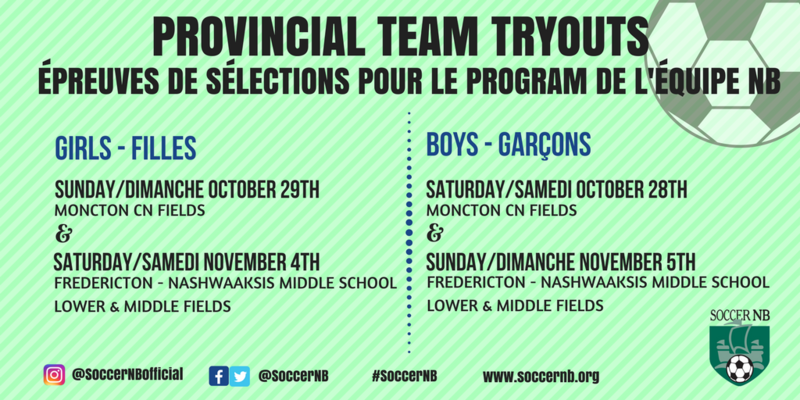 The Soccer New-Brunswick Technical Department would like to inform you that the 2017 Team NB Try-Outs are being held in Moncton Saturday October 28th for boys & Sunday October 29th for girls and at a second location TBC on Saturday November 4th for girls and Sunday November 5th for boys. We are ready for another great season and hope you can attend the Try-Outs! The age groups are U13 (2005+), U14 (2004), U15 (2003), U16 (2002), U18 (2000-2001), Male and Female. You can pay the $20 (CASH/CHQ only) registration fee at your arrival or 30 minutes before the tryouts. We will have a registration table set up to gather the payment. Please share the name and year of birth of your child upon arrival to pay. Stay Connected and Follow us on Twitter, Instagram & Facebook.